Danny Hatmaker is a character in the HD Universe who appears as a minor character in Grand Theft Auto IV. Danny Hatmaker is an arms dealer based out of Normandy, Alderney. 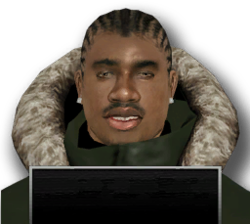 By 2008, he is wanted by the Liberty City Police Department for arms dealing. Niko Bellic, depending on the player's choice, can kill Hatmaker. This page was last modified on 2 June 2015, at 19:19.